We’ve finally reached the point where we have to stop putting things into the game – the last tweaks to combat have been made and the final Easter eggs are hidden for you to find. So now we are focused solely on fixing bugs and getting Shadow of the Beast ready to appear on PlayStation Store. We have been working closely with Sony to find the best time to release and now we have a definitive release date: 17th May 2016. Our small team has been using the extra time to the fullest – we’ve been able to push the game to a solid 60fps throughout, something we feel passionate about as fans of the fighting genre. With the increased response time that comes with this we’ve been fine tuning the combat experience even more; upgrading Aarbron to the full extent of his abilities and equipping him with some of the mystic artefacts that you find will really add much more depth to the gameplay. It feels quite different to other combat-adventure games, but hopefully people will find it very rewarding! Just before we go, we’d like to share a few new screenshots from the game, including one that reveals a feature we haven’t talked about yet – the gun! 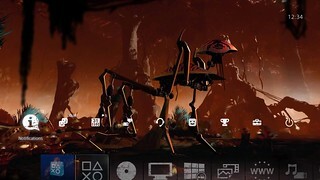 Finally, we are also very excited to be able to reveal exclusively here on PlayStation Blog that pre-ordering will net you a fantastic free dynamic theme featuring a brand new original creature designed by acclaimed artist Roger Dean! Roger was the creator of the cover art for the original Shadow Of The Beast game and its sequel, so it’s a massive honour to have him revisit the universe with our game! Here’s a sneak peek preview image of what you can expect…. If all that has you interested, then the game is available to pre-order on PlayStation Store now – and with the new dynamic theme you can fully immerse yourself in the world of Karamoon when the game arrives on 17th May 2016! Thanks for taking the time to read about our game, it is genuinely appreciated! The PS4 is set for a big year with plenty of highly-anticipated exclusives and games on the horizon, though the system is also getting several new features with its continued updates and additions, with tomorrow bringing a new firmware update that will bridge the gap a bit more between PC and PlayStation owners. Sony announced in a new update on the PlayStation Blog that PS4 System Update 3.50 (codenamed “Musashi”) will officially release tomorrow, April 6th, 2016, with the new update to bring a variety of new features and updates to the system including the long-awaited introduction of Remote Play to PC and Mac owners. Musashi will introduce a variety of new social features to the PS4, including the ability to set your online status to appear “Offline” (either from your profile tab or accessing the Quick Menu by holding down the DualShock 4’s PS Button), notifications when specifically-designated friends go online, and the ability to schedule “events” with other players to create a party/send invitations for a game at a specific time or date, chosen by the user. The update will also introduce the new “Play Together” feature, which allows all members of a Party to see what other party members are playing for an easier time joining a friend in-game, or to start a new game with them. Users can play with a DualShock 4 on PC or Mac connected via USB for access to Remote Play. After the launch of the new system update tomorrow, users can download the Remote Play client for PC/Mac by clicking here. Remote Play on PC is pretty cool, though it basically renders my PSTV useless now. During Take-Two Interactive’s quarterly financial conference call, CEO Strauss Zelnick talked about the performance of Rockstar Games’ PS2 titles recently released on PS4. According to Zelnick, Rockstar Games is enjoying “tremendous success” with its re-releases, and is the top publisher for PlayStation 2 classics on PS4, with three of the top five highest selling games. At the moment, Rockstar’s PS2 games on PS4 include Grand Theft Auto: San Andreas, Grand Theft Auto III, Grand Theft Auto: Vice City, Grand Theft Auto: The Trilogy and Bully. Think all the Rockster PS2 games are on special ATM. Might get the GTA Trilogy next week. SWOS is better, but this looks like it could be fun. It’s hard to believe that it’s been nearly two weeks since we officially released Uncharted 4: A Thief’s End on PS4. It’s one of the most beautifully crafted games I’ve ever played, and the great reception we’ve seen from the community has been amazing and humbling. Naughty Dog’s exceptionally talented team has created magic once again, carefully constructing an adrenaline-pumping, thrilling, and beautifully written culmination to Nathan Drake’s adventures. They truly outdid themselves. Millions of fans around the world have already joined Nathan Drake on his final treasure hunt. In the first week alone, I’m happy to report that Uncharted 4: A Thief’s End exceeded 2.7 million units in global sales*. For the North American region, Uncharted 4 is the fastest-selling PS4 first party title to-date. A huge congratulations goes out to Naughty Dog for an incredible feat. The success of the game is a testament to the caliber of the team at Naughty Dog and their unwavering commitment to their fans. Most of all, we wanted to give a special thank you to all of you who joined us so far on this incredible adventure, and have embarked with us on Nathan Drake’s final, wild ride. * Includes worldwide sell-through data for both Blu-ray Disc sell-thru quantities and digital sales as of May 16, 2016. Does anyone know if Fire Pro Returns is playable on PS4? My cousin has one and wants a good wrestling game, I figured that he could just log on with my old PSN account and download it? Matisfaction wrote: Does anyone know if Fire Pro Returns is playable on PS4? My cousin has one and wants a good wrestling game, I figured that he could just log on with my old PSN account and download it? It's not. Not that many PS2 games have been added so far. Horizon Zero Dawn has been delayed until February 28th, 2017 in the US, March 1st in Europe & March 3rd in the UK. That game does look pretty cool. I haven't even heard of it until this week. I'd like to see some actual gameplay, though. The showed some gameplay at last year's E3. -Two new characters, each with their own weapons and tactics! -1-4 player mode, where each player can take on one of the four characters! -NEW Boss Enemies and Special Weapons! Come and play this weekend and take on friends, rivals and the world in action-packed online-multiplayer for any of the titles you own with multiplayer modes. You have from 10:00 BST 24 June until 10:00 BST 27 June 2016 to play online at no cost. Round up your buddies pronto or find new ones online from around the world because now is the perfect time to check out all the newest multiplayer games and DLC you own. Whether you choose to journey through hell in DOOM, fight through paradise in Uncharted 4 or get in the sporting spirit with Pro Evolution Soccer, the world of online multiplayer is your oyster for an entire weekend. So boot up all your favourite titles and get online – there’s no excuses for missing out! There’s more to PlayStation than online multiplayer – if you’re not a member yet, find out about all the other great features such as 24 games a year at no extra cost, exclusive discounts, 10 GB cloud storage and more, here.